Now, however, it’s 5 percent, not 4 percent, and it’s not inventions licensed but rather inventions used. It’s a wonderful bit of bluffery. 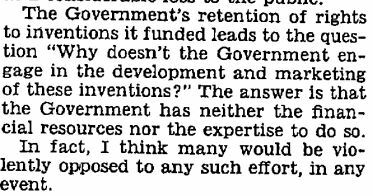 There’s nothing in Forman’s 1976 testimony that would support the claim that the government knew how many inventions covered by its patents were actually being used. At best we know that most of those patented inventions were defense-related, and the defense contractors had declined to own the inventions and patent them. There’s nothing to indicate that the lack of a monopoly position had anything to do with whether any given patented invention owned by the federal government would be used or not, licensed or not, developed or not. Dole here is just bluffing. In these two sentences, Senator Dole repudiates the last vestiges of Vannever Bush’s Science the Endless Frontier, the report that provided the impetus for ramping up federal research spending for university-hosted scientific research. Bush had argued that the federal government had a legitimate interest in opening up new areas for public use by funding exploration, and science was no different. For Bush, the “free play of free intellects” at universities was the best way to open up new scientific frontiers, and Bush distinguished this research from that of government laboratories–directed at government agency missions–and industrial laboratories–directed at the production of technology in support of products. Dole conflates government procurement–where the government commissions research for the purpose of using the results in its programs–with the thirty year commitment to expanding basic scientific research. Most of those 26,000 or 28,000 or 30,000 patents owned by the federal government were directed at defense procurement. The “market” for weapons-related inventions might well be only that provided by the government making decisions to purchase products that include the specified inventions. An effect in patenting these inventions and making them available to all was to level the bidding environment for companies wishing to sell products to the Department of Defense. The profit position for these companies does not depend on their patents but rather on their ability to compete for contracts and sell products to the federal government. The reality was–and is–that if the federal government did not patent these inventions, no one involved in defense or atomic energy or space technology contracting would. As the Harbridge House study in 1968 documented–for a vast majority of these inventions, there was no private industrial market and no consumer market and never would be. The folks who would think to patent such inventions would be speculators looking to disrupt government-industry relationships by asserting patent positions to drain off a share of industry profits arising from supplying products to the government. And these folks turn out to be the patent brokers who persuaded universities that they could make money for research by splitting the profits from a patent trade with the patent brokers. The products that the American public might look to from defense procurement would be better military equipment, not consumer products. But Senator Dole didn’t bother with that angle. In other areas of federal procurement of research services, federal agencies did develop products. The Department of Agriculture produced new fertilizers and tomato pickers, which companies then proceeded to manufacture and sell. The Department of the Interior and the Department of Transportation also produced technologies directed at their missions and released these for use when they were developed “to the point of practical application”–again, with the criterion being fit for use in agency programs. We are left with two areas to consider. First, basic scientific research. The point of federal support for basic research is to expand scientific frontiers. The “return” to the public is not that discoveries in basic science lead directly to consumer products, but only if patented and monopolized by some single company–rather the “return” is in the form of greater scientific knowledge in new areas of inquiry. In Vannevar Bush’s approach, new science might then be combined with engineering and industry smarts in a directed project to develop a specific product for government or public use. Filing patents on such discoveries in basic science and withholding access in favor of a single company that will hold a monopoly for nearly two decades disables Bush’s approach and fragments research work in a common area across the various organizations that engage that area. In the area of carbon nanotubes, for instance, scores of organizations hold thousands of patents on just about every aspect of a nanotube. No one can do much of anything in such a gridlock of nonprofits all hunting for exclusive deals until the patents all expire. Patenting in basic research works pretty much only to support an early commons–(i) digital computer, internet; (ii) to support standards that promote interoperability among products produced by different companies; and (iii) where there is a robust public domain of cumulative technology and the invention involves a downstream development, a “nonessential” invention, from the perspective of the early commons or standard. Dole conflates all these uses for patents and insists that the results of basic research must be used as consumer products, and to that end organizations must be given incentives to patent as much as they can in the hope of “commercializing” inventions. It’s a disastrous proposition for Vannever Bush’s vision of what is possible if the federal government opens up new areas for scientific work. Dole’s vision–and that of those who take up Bayh-Dole–is to cut off the ability of many people to draw from new science and instead sell off the new science for patent speculation well before any commons or standards have a chance to form. The effect then is to prevent access to new science for two decades–preventing Bush’s skunk works of targeted development to ever get underway, at least not in the U.S.
Dole’s contention that private patent monopolies are necessary for the public to “reap a return” on basic science necessarily displaces Bush’s idea that science should open up territory and the public’s benefit lies well downstream–but won’t happen at all if there’s no basic research to open the scientific frontier in the first place. The second area to consider is biomedical research–“exploration into fields that directly concern the public health,” as section 1(a)(2) of the Kennedy patent policy puts it. It’s here, in the NIH research agenda, that we hit the problems with patents. The Harbridge House documented the pharmaceutical industry boycott of federally supported inventions in the area of medicinal chemistry, primarily over the potential for “contamination” of privately financed research with federal money which required inventions to become accessible to all. We might see in the pharmaceutical industry boycott a collision between open research and proprietary research. We might also see in the boycott a competition between government and industry to open up a new scientific frontier. And there’s no doubt that in a “science will provide” way, the public might expect new medical interventions–preventions, cures, methods–that improve health, beat back disease, heal injuries. It is here, in medicinal chemistry, that the government agenda for research into areas directly concerning public health goes awry. The government’s own attorneys, such as Norman Latker at the NIH, see the government’s role as one of building up the capabilities of the pharmaceutical industry on the analogy of the chemical industry or the electronics industry. For that, passing patent monopolies to pharmaceutical companies seems to be just the thing, and Latker worked diligently to do just that–first with the IPA program and then with Bayh-Dole. The great horror in the work of these government attorneys–including Forman and Johnson–however, was that they hid their agenda in a generalized claim that all inventions, to be used, must be the subject of patent monopolies and that an apparatus of public protections would prevent any abuse of those monopolies by the companies involved. Rather than creating an NIH patent policy directly addressing the role of private monopolies in areas of exploration concerning public health, these attorneys relied on the monopoly meme to promise the public that science would only provide if it were parceled out in patent monopolies for private speculation. Huge profits–meaning high prices protected by suppressing competing uses and competing development–were a necessary by-product of such speculation and should be viewed as a sign of success, not as a sign of monopoly exploitation of public health needs. The monopoly meme as built into federal research patent policy has been devastating for scientific and technology infrastructure in the United States. It’s difficult to document the absence of something–that’s one place where a demand for “evidence” is misplaced. The evidence in this case is a lack–a lack of a robust public domain, of cumulative technologies, of broad access to research findings, of freedoms to mess around with things. One cannot so easily count or measure what isn’t there–the commons, the ad hoc standards, the cumulative technology libraries. Dole imagines that the federal government has made a “promise” to the American people and by failing to pass publicly supported inventions to private companies for two decades of monopoly control, the federal government has “reneged” on that “promise.” If there is a promise made in the area of public health research, it may well be a failure by the federal government to undertake public development of health “technologies”–vaccines, drugs, devices, methods–to the “point of practical application” before releasing these new things for public use, professional use, and commercial development. The companies that might participate in such development are those whose business model is that of contract research rather than proprietary product development. When Medivision, pretty much a shell investment company, acquired the rights to what would become Xtandi, a drug to fight prostate cancer, it used firms willing to provide contract services to develop the drug, and did so for less than one third the claimed average cost for the pharmaceutical industry to develop a drug–about the cost of one F-35 fighter aircraft. The federal government clearly has both the resources and the capability to do the same thing. If pharmaceutical companies refuse to provide services under contract to screen and develop candidate compounds, many other companies clearly are ready to do so–the same ones that pharmaceutical companies partner with for their own proprietary candidate compounds. Across many federal agencies, the public has had no objection, let alone violent opposition, to the government developing research to the point of practical application. The military does this–fortunately. NASA did this with space technology. The Department of Energy has done this with nuclear power and has made the attempt to do so with alternative energy systems. No big outcry. But Dole throws in “marketing” along with “development,” as if the federal government ought to go into the business of selling product to the public. The public purchases drinking water and electricity from public entities–without much bother in doing so. But Dole’s answer–that the government doesn’t have the resources or expertise–was wrong at the time and is still wrong today. The government does have the resources for a great many inventions–the question is rather whether there is a public need that justifies those resources, and that’s a much more difficult question to answer. And the government does not have to have the expertise–it just needs to contract with that expertise. In the area of drug development, there’s plenty of expertise that’s not so committed to the pharmaceutical industry that it would refuse to work for the federal government to develop a life-saving drug to the point of practical application–through clinical trials, say. The upshot of Dole’s rhetoric is that Bayh-Dole is positioned to prevent the NIH from overseeing the development of any medical invention to the point of practical application. To do so would bypass the pharmaceutical industry as we know it–a group of companies fully committed to patent monopolies, a throwback to the 1920s and 30s, like United Shoe Machinery. For the NIH to coordinate the development of medicines, it would have to declare an exceptional circumstance–and make that exception the baseline of its research grants to nonprofits, so that no nonprofit could preempt the overall goal of gathering inventive work and developing it into vaccines, cures, diagnostics, and the like. Such an approach would focus on creating commons, cumulative technologies, standards, shared data sets, shared research and development tools. At the end of each process, once there was a demonstrated new technology, companies could compete to improve manufacturing methods and extend new technology in nonessential directions. Research would fuel what is now called the “generic” side of drug manufacturing. Generic introduction of prescription drugs would come before brand names were attached. A brand name version would have to improve on the generic version of the drug–by quality, by price, by method of delivery, by combinations with other compounds, whatever. The important point is that there is no way to deal with innovation from research in the abstract by throwing around terms like invention and patent, investment and commercialization. Different areas of research require different approaches. Different industries have adopted different approaches. The agenda behind Bayh-Dole has been to prevent the formation of commons, cumulative technology, and standards in areas directly concerning public health. Instead, people are asked to fixate on the prospect of sudden wealth arising from patent positions that fragment early research to make it unavailable for open approaches and collective development. Even if we were to accept a federal policy to bulk up major pharmaceutical companies against “generic” competition by supplying them through a pipeline of patent monopolies acquired by university administrations receiving federal funding–even if all this–there’s absolutely no good reason to extend that same approach to all areas of research, to all industries, to all technologies. Makes no sense whatsoever. Senator Dole bluffed Congress into backing S. 414, and we have got Bayh-Dole. It’s a disaster. I’m sorry Senator Dole. It hasn’t worked out. You and Senator Bayh did what politicians do–bluff your way past your colleagues to get something for your constituents. But you didn’t provide us with a workable approach to encourage innovation from federally supported basic research. The problem is not with federal patent policy, but with a failure at the NIH to shape its programs to include development. The NIH ought to act more like the Department of Defense, or the Atomic Energy Commission, or NASA than like, well, the NIH. Instead, it has promoted the pharmaceutical industry with its expensive, innovation-killing patent usage. The NIH produced Bayh-Dole and has stuck with the law all these years. That’s where the problem lies–exactly where the Harbridge House described it in 1968–and that’s where the solution begins. 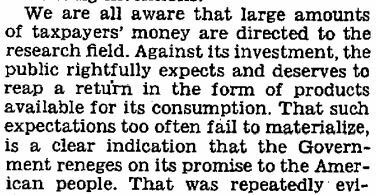 For the rest of basic research at universities–free it up from the patent carnage created by Bayh-Dole. And don’t think recovery will be easy. This entry was posted in Bayh-Dole and tagged basic science, Bayh-Dole, bluff, Dole, investment, Vannever Bush. Bookmark the permalink.